I love the concept of thanksgiving. When I lived in California, I really embraced the holiday. I mean taking the time to get together with your loved ones and give thanks for the joy of our family and friends, thrown in with a big feast. What’s not to love about that? But the sad truth is, Thanksgiving tends to be an incredibly stressful time for home cooks. I still remember my first time cooking a whole turkey for my family. At the time I thought of myself as a pretty competent cook. But when it came down to it, the whole turkey thing terrified me. I found myself stressing out and snapping at people, rather than enjoying the day. Not a good look. With some help from my mum, the turkey ended up being edible but I learnt a very important lesson. Cooking a big dinner is hard work and there’s a lot of pressure so it pays to be super prepared. These days, with many a turkey (and one failed goose) under my belt, I feel confident and comfortable when turkey is on the menu. So I thought I’d share with you what I see as the most common Thanksgiving mistake. And of course give you some pointers on how you can avoid it. I also wanted to share that I’m running a short 1 day masterclass at the Stonesoup Virtual Cookery School called Stress-Free Thanksgiving. So what is the most common Thanksgiving mistake? Three words: too much food. And how can you avoid it? Less is more in so many ways. Not only does a simple menu mean there will be less types of food, it also means less for the cook to juggle, making it easier to cook the dishes you are serving to perfection. If you must serve a starter, go for something super simple and small like a bowl of perfectly marinated olive or some excellent quality bread and extra virgin olive oil. With such a massive main course and dessert on the way, it’s best to save your guests appetites for the main event. It can be tempting to keep adding to your side dishes but this is where things can quickly get out of control. I’d aim for one starchy side, like potatoes and something green, like a simple perfectly dressed green salad or some fresh green beans. It’s a natural human tendency to over cater. Trust that there will naturally be leftovers and skip the urge to increase your shopping list. I love my sweet treats as much as the next girl, but I’ve noticed whenever I have people over for dinner and serve more than one dessert, everyone always overeats. It’s never as satisfying as enjoying a small portion of one perfectly cooked pie. If you’re only serving 12, expect quite a bit of leftover ham. I assure you this won’t be a problem, You can either carve it up and give your guests a little ‘doggy bag’ to take away, or save it for all manner of leftovers. Ham & lentils soup, ham sandwiches, fried ham and eggs. You could also use a 1/2 ham and cut back on the glaze – just use 1/2 the jar of marmalade. The cooking time may be slightly less but not significantly. Likewise, if your ham is a giant, even an 8kg one will be fine with this amount of glaze and the cooking time should be about the same, maybe a few minutes more. The beautiful thing about a good ham is that they’re almost impossible to overcook. If you undercook it there’s no food safety risk, but you’ll be missing out on the crispy, salty sweet goodness. Perfect for people who are a bit nervous about large hunks of meat. The other wonderful thing is that ham isn’t fussy about its serving temperature. So you can glaze it well ahead of time and serve at room temperature. Or once it’s done, keep it covered in a really low oven (100C /200F) for up to 2 hours. Highly recommend investing in a disposable aluminum baking dish for cooking your ham. Saves on washing up and is a great place to store your ham in the fridge. 2. With a sharp knife, carefully cut away the tough skin from the top side of the ham, leaving as much luscious fat as you can. 3. Score the ham in a diagonal pattern with cuts about 1inch apart. Make sure you cut through the fat and just into the flesh. 4. Press one clove into the centre of each diamond. 5. Place in a baking tray, surrounding with the decorational rosemary, if using. Bake for 20 minutes. 6. Meanwhile, heat the marmalade and rosemary leaves in a small saucepan unit it simmers. Remove from the heat. 7. After the ham has been in for 20 minutes, pour 1/2 the glaze over the top, spreading it evenly with a pastry brush, spoon or a little branch of rosemary. 8. Return to the oven, turning so the front goes to the back for another 20 minutes. 9. Smear over the remaining glaze using the method in step 7. 10. Bake for another 20 minutes, remembering to turn again. 11. After the ham has been in for 1 hour, remove and baste by scooping the juices from the bottom of the pan and drizzling over the top. 12. Bake for another 20 minutes, remembering to turn again. 13. After the ham has been in for 1 hour 20minutes it should be done. You’re looking for it to be lovely and deeply caramelised on top. If not, continue to base and check every 10 minutes until well coloured. 14. Serve hot or at room temperature. 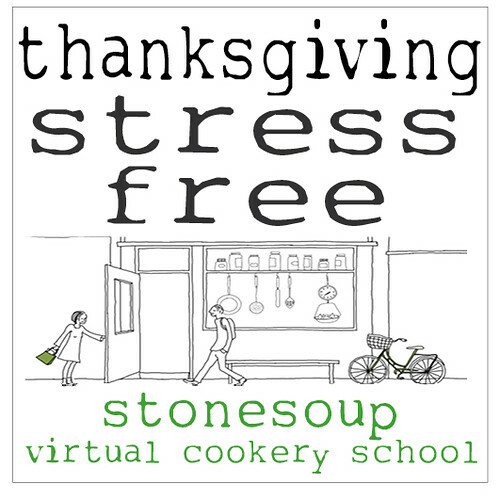 Registration is now open for my Stress-Free Thanksgiving Masterclass at the Stonesoup Virtual Cookery School. And I’ve pulled together a calender of classes for the next three months, why not see if there’s anything that piques your learning curiosity? 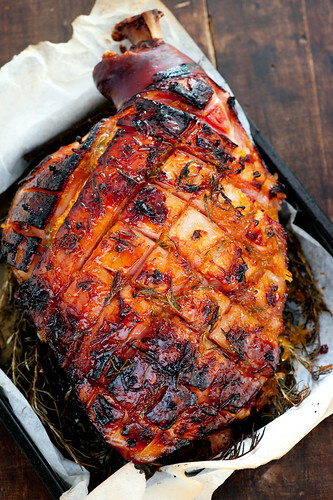 To me, there’s nothing more festive than a beautifully glazed leg of ham- and that’s a particularly stunning one! That ham looks delicious! My mom always makes ham at Christmas…but I just don’t seem to find the right cut here in Germany for one. Which is kinda strange since Germans LOVE pork. May I add another suggestion to your list? One from my years behind a meat counter? As a customer, you are in the store for less than an hour. The employee handling your order may be putting in a 14-hour day. And, she’s probably going home to cook her own turkey when it’s all over! Oh my gosh, that ham just looks amazing! Will definitley show up on our christmas table for sure! I am so “with you” on the starters! A tray of carrot and celery sticks with a couple of kinds of olives is all that is needed before the starch-heavy meal. Great points! 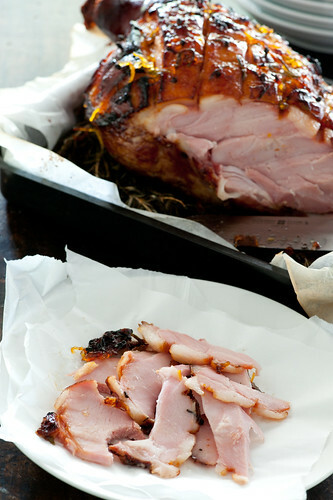 Also, I’m bookmarking this ham recipe for Christmas–it looks just perfect! This is an awesome guide to a stress free thanksgiving! I’m not cooking this year (well, maybe just the pie) but I’ll keep this advice close to heart when I start my own family traditions – like you said, it’s so so easy to stress out and plan too much when you’re feeding a large crowd. Simple is key. Thanks! wonderful addition – a great reminder that it can be a stressful time for more than just the cooks! I find it odd that they don’t sell gammon very commonly here in Sydney – have had some failures trying to explain it to a few butchers.. 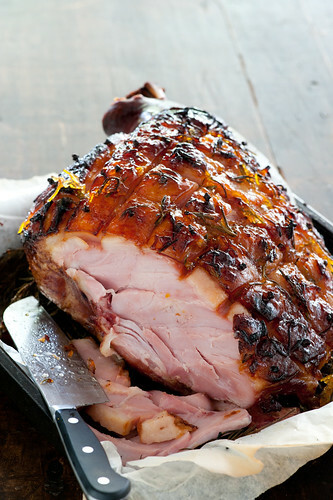 I am learning to cook ham like this, but wondered if you’d had any luck sourcing it.. Am doing Christmas this year, so I’m taking notes on simplicity! no I haven’t come across gammon in sydney but I’ve wondered about it – nigel slater has quite a few gammon recipes in his wonderful books. have you tried Lucas Meats in Bronte? they specialise in the most amazing hams (like the one pictured above) and are very serious about their pork – so am sure they’d be able to help you out. I’m running a 5 ingredients christmas class early december on the Virtual Cookery School which might be useful. fabulous post! I have posted it on facebook to share some thanksgiving culture in Tuscany! Thanks for the tips on stress free Thanksgiving. I’m new to entertaining and having dinner parties and I definitely could use some of those tips next time! Invest in an electric roaster. Your turkey will be cooking while your oven is cooking everything else. My oven is currently dead, so I actually cooked my turkey this weekend and put most of the meat in the freezer. Green beans are done and in the freezer also. I have two questions about the ham. This is my first time making a ham. Do you score the whole ham all the way around or just the top. If I were to use dried rosemary, approx. how much would I use? you just score the top of the ham. and I’m not really familiar with dried rosemary but I imagine a tablespoon would be all you’d need. good luck with your ham! 1. Was the ham fresh or frozen, like those pre-packed vacuumed seal ham? 2. You said “cut away the tough skin from the top side of the ham,” why not the whole leg? Can I cut the away the whole skin out?